I have a Lizard piggyback trailer. Having never launched anything bigger than an Albacore and in the absence of any instructions on how to launch “the right way” I used common sense when we had the mast stepped and were ready to get her wet. I reversed down the slip to a point where I was able to fit the ramps without getting my feet wet. We then winched the launching trailer off the main trailer until the jockey wheel hit the stop. At this point the boat was still high and dry. So I took out the ramps and reversed the car down the slip slowly until the main trailer wheels were mostly submerged and fortunately both trailers went down. At this point Riant was still struggling to float so I took my 16 stone on board and stood at the stern gently rocking and she glided off like a good un. I could have taken the trailer down a good bit further until my car wheels were in the water but was concerned that the launching trailer might get stuck. I would very much appreciate feedback on other peoples experience with this trailer set up. Did I tackle it in the right way? Should I have taken the whole lot further into the water? Is this trailer set up the best for Romilly or is a break back a better option? I don’t intend to take her out of the water for some time but what is the bast way to takle this when I come to? I really enjoyed your writing and your photos. We have a Romilly in Florida where we don’t need weights for the mooring lines as the boat balances on a boat lift. 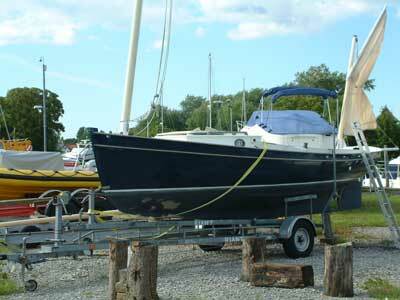 I say balances because the keel is so wide that the boat doesn’t need the bilge supports, she just sits there. Maybe we can find a way to post some photos. We have an ongoing problem with the centre-plate winch so if you know anything about that device (eg who makes it?) I would like to hear from you.